The bell sounds. This life-long prizefighter bounds from her corner throwing jabs and hooks. The eldest child of immigrants, teacher, and union organizer in the New York City schools, Trina, a fierce and valuable ally, was not to be danced around. The paradox is that at 83, she was still throwing punches, but forgetting which direction her opponent’s were coming from! 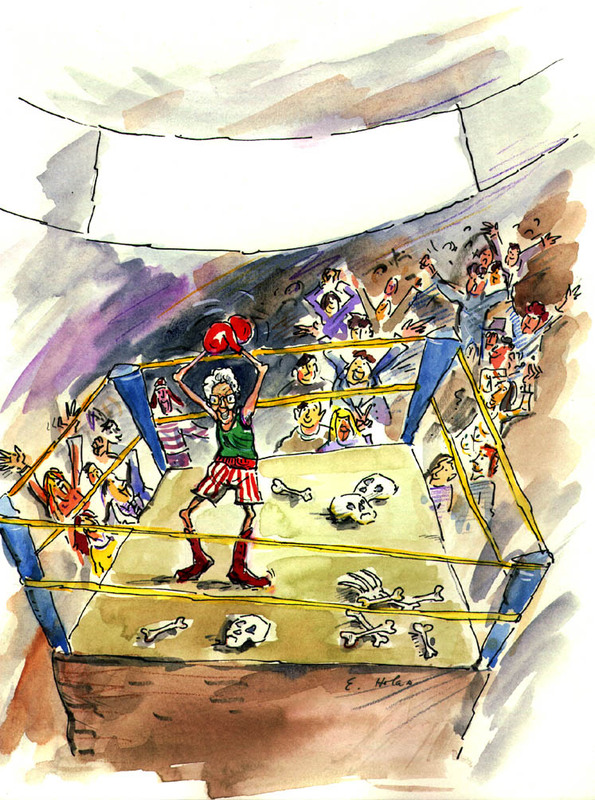 This is a story about coaching a feisty prizewinner through her last big bout, only this one is visited by landmarks of laughter and redemption. When Michael, who always referred to his mother as “the little Pitt Bull,” discovers he is the only one available to guide her through the maze of Alzheimer’s and into death, he feels the same thrill you and I might at the prospect of going for a root canal. Like the necessary dental work, you enter with your fists balled up and your breath held. The process, we learned, can bring more than relief. You are hereby invited to take this journey; the physical one from downsizing and dealing with the medical and elder care establishment, the social one involving the delicate weave of family relationships and the spiritual one that takes this son from angry boy to soulful adult. Social Workers, Nurses, Physicians and support professionals all require continued education in order to remain vital in their work. Retiring the Champ has been used to draw both professional and support staff together, present them with a completely different vantage point on the issues they deal with daily, allow a forum to discuss important topics, and provide the continuing education credits that are often a requirement of their work. 1. be called upon to discern the difference between a clients issues and needs and those of their extended family. 2. become aware of the holes in the medical system that can exacerbate rather than help or heal the problems of elderly. 3. have their attention drawn to the delicate weave of family and how it effects the care and condition of the elderly. 4. be made aware of the difference between personalized and systematized care. 5. be inspired to reflect upon the hierarchy of assisted living, rehabilitation, and nursing home facilities and how it effects the care delivered. Who has used this story? As an entertainment or springboard for professional training these tales will engage both the head and hearts of participants, enabling them to welcome new ideas, issues, and perspectives into the work they do. Theatrical storytelling by Judith Black, one of the nation’s most revered practitioners of the art, speaks to the heart, the imagination, and the intellect. CHARGE NURSE, initially commissioned by the Pediatric Emergency Nursing Conference in Rocky Hill, Connecticut, is a slice of ED life. It focuses on the single shift of one charge nurse, the issues that move her day, and reflections on those issues from four other nurses representing a broad cross section of the profession. From green nurses setting IVs to the profound effects of working with dying children, the enigmas of this profession are explored in a way that resonates with audiences from both sides of the triage desk. “You are an amazing storyteller. It is a gift to be so energetic and talented. I really related and it made me see the Charge Nurse role more clearly. Thanks. “Characters were so true to those in our own ED – Fantastic!